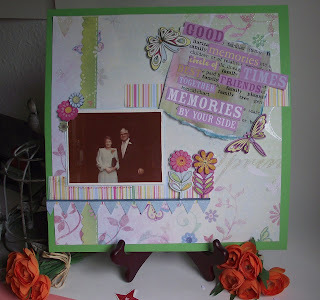 My latest scrapbook page is one of my favourite photos of my parents at my sister's wedding. I'm afraid this old and a little bit degraded photo does not show the colours very well, but the photo itself means a lot to me so worthy of a dedicated page. I copied the meaning of the word 'family' from a dictionary and then enlarged it unil I was happy with the size. The image was then treated with a wash of water-based inks in green, blue and pink and allowed to dry. I further distressed the paper by tearing it and adding pre-printed words, adhered to the page to link with the word 'family'. The 30x30 background sheet is from a Folio paper pack. The spritzing and water colour technique gives a lovely soft feel to your card. Nicely done.